We already have a fair amount of information regarding Devadatta. We feel sorry even when we think of how the life of this unfortunate person got filled with sins. Even though he met the Buddha, became a monk, developed concentration, reached the level of being able to perform miracles, he failed to achieve the fortune of understanding life. He lost all the merits that were in him. You have learned how his hatred originated. Devadatta’s hatred was a peculiar one. It was a distorted desire. There was no limit to vengeance. He was not satisfied by just conspiring against the Lord Buddha, but also dreamed to see the destruction of the Lord Buddha. Like a blind man striking his head against a rock, he tried hard to destroy the Lord Buddha. At one time, he sent about thirty armed men from the army of king Ajasatta to assassinate the Lord Buddha. All of them exposed the conspiracy and became monks. There was a very ferocious elephant. It used to get provoked even for trivial things. It was a large animal and called Nalagiri. Devadatta found out about the streets in which the Lord Buddha would be walking to collect alms. One day, this elephant was made to drink sixteen pots of toddy. It became very intoxicated. They made the elephant wild with anger by getting the mahouts to poke it with the goad. Its eyes became red. It spread out its ears. Raised its tale. Started digging the ground. Started thundering in anger. Raised its trunk. It jumped onto the road in one hop. It uprooted the trees in the background and smashed shops it confronted. People who saw this ran helter skelter. The street became a battle ground. People who came forward were torn to pieces. It was running non stop like a lunatic. The Lord Buddha was walking towards the elephant. Ananda thero who was walking behind got terrified. “Oh there, there is a fierce elephant coming. It is coming this way. What is to be done? Yes, by the way it is coming, the Lord Buddha would get attacked. No, no, I can’t allow it to happen. May anything happen to me. I will sacrifice my life”. Thinking thus he jumped forward. The Lord Buddha quickly brought Ananda thero behind him. The Lord Buddha spoke kindly to the elephant and preached Dhamma. Every word was full of kindness and was understood by the elephant. It became sober. His violent nature disappeared. It became harmless. It became a very tame elephant. After that, Devadatta thought “That also did not succeed. Every plan I prepare becomes unsuccessful. It is not possible to get outsiders to get this job done. Best thing would be to carry it out by myself. One day, Devadatta secretly climbed to the top of Gijjakuta mountain. It was not a big mountain. There were two cabins at the summit. The Lord Buddha was pacing about in a shady place at a lower level. Devadatta rolled a large stone aiming at the head of the Lord Buddha from the top of the mountain. When the stone was falling down fast another stone surprisingly fell and struck the earlier stone, and it got thrown away in another direction. During the collision, a splinter separated and struck the left big toe of the Lord Buddha. The toe started bleeding. Devadatta quickly went into hiding. He committed the anantariya sin (Conduct that finds retribution without delay) of shedding the blood of the Buddha. This unworthy man still did not know good from bad. He still did not understand that it was he who was going to suffer because of these terrible sins. The assassination he had planned to carryout himself also became unsuccessful. This unworthy man next thought committing the sin of creating a division among the monks. He was able to mislead five hundred freshly ordained monks based on five facts. These five hundred monks thought that Devadatta was indeed a loyal friend. They got deceived. The hypocritical talk of Devadatta was successful in getting them to follow him. They were brought under the submission saying that if they remain with him he would show them the quick path to salvation. He set off to Gaya with them and started to preach them. The Bhikkus also listened to them with the expectation of entering the path to salvation. But Devadatta’s intention was not to guide them to salvation but to set them against the Lord Buddha. When the Lord Buddha heard about this He addressed his chief disciples, “Sariputta, Moggallana, you proceed immediately. The newly ordained monks have failed to identify the loyal friends. Save them before they become victims of Devadatta’s sinful intentions.” Accordingly, the two Arahants proceeded to Gaya immediately. Suffering from excessive conceit and affected by depraved desire of becoming a leader, Devadatta saw Arahants Sariputta and Moggallana coming towards them and shouted. “Oh monks, Look there. Who is correct? It is now clear I am correct. Do you see the chief disciples coming to me? Do you see in whose hands the Buddhist order is?” When the Arahants came close he said. “Oh Sariputta, come and sit on my right hand side and Moggallana, sit on my left hand side. Now I am the leader of the Sasana. I have been preaching for a long time. My back is paining slightly. I will lie down for some time. In the meantime, you preach to these monks.” Devadatta lay down. That unworthy person who had a sinful mind and had no mindfulness fell asleep instantaneously. He slept snoring. When Arahant Sariputta was preaching the freshly ordained monks who had been mislead by Devadatta realized the truth. They understood who the genuine friend was. They understood the Four Noble Truths also. Arahants Moggallana performed miracles and explained the facts of the Dhamma. All the five hundred monks attained the state of Sotapanna. Finally, when Arahant Sariputta and Moggallana were returning all the five hundred monks followed to see the Lord Buddha. Kokalika, the friend of Devadatta was also a sinful person. He came Devadatta’s place and there was no one to be seen. All had set off with the Arahants. Kokalika got angry. “You shout saying that you must save everyone. Now the five hundred who came with us have been taken away by Sariputta and Moggallana. This fellow is snoring and sleeping.” Saying so, he nudged Devadatta’s chest with his elbow. Devadatta woke up. Got up in a hurry. Looked around with wide eyes. There was no one. His plan failed again. He thought about it and warm blood came out of his mouth. Devadatta fell sick. He suffered for nine months. It became worse day by day. He began to see all his mistakes one by one as in a film. He remembered that the Lord Buddha had not done anything against him when he was doing so much against the Lord Buddha. Devadatta felt a desire to see the Lord Buddha. “Please take me to see the Lord Buddha. It is enough if I could just see him before I die. People who were attending to Devadatta placed him on a bed and set off to Savatti. 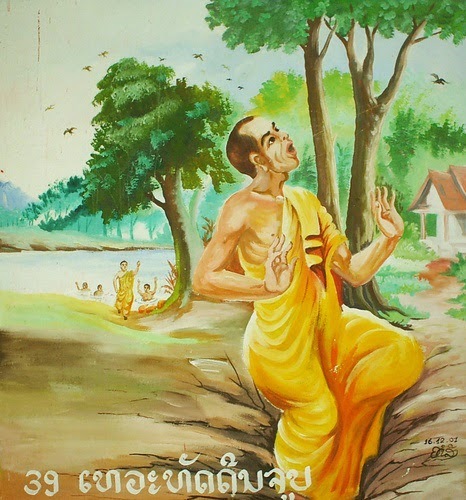 On the road to Jetawanaramaya in Savatti, he saw a pond on the road side. An unbearable burning sensation arose in his entire body. He felt like stepping into the pond. The attendants kept the bed on the ground. As soon as he got down from the bed and stood up, flames came up from the ground and covered him. At that final moment, he turned towards Jetawanaramaya and said “I seek refuge in the Lord Buddha.” After that, he got sunk in the ground. On hearing of this incident, the Lord Buddha preached a stanza. Its meaning is indicated below. The nature of these impure thoughts are very dangerous. Let us see who Devadatta is. He is Yasodhara’s brother, Prince Rahula’s uncle, and the Brother in low of the Prince Siddaththa. What a close relationship! Princess Yasodhara became an Arahant. Prince Rahula became an Arahant. Prince Siddaththa was able to become a Buddha as the fourth Buddha in this Maha Bhadra Kalpa. But because of perverted desires, conceit, anger vengeance, desire for the leadership, he accumulated sins that resulted in his birth in the hell of Aveechi. For the next kalpa, he will suffer in hell without even a moment of happiness. He committed the sin of Anantariya. Creating division among united monks and drawing them to one’s sideA person who has understood the Four Noble Truths will be free from these sins for ever. The main reason for these sins is the mundane life in which unworthiness and ingratitude predominate. That is, if one does not develop the way for attaining at least the Sotapanna state, he has the risk of facing this danger. Even if one does not commit these sins in this life, there is a possibility of committing these sins in the next birth. Therefore, the only protection we have is to understand the Four Noble Truths during the Gautama Buddha Sasana and during this life itself. Some may ask as to how such things can be done when paramitas have to be fulfilled and becoming Sotapanna is cannot be done so easily. But the Lord Buddha has not told anyone that Paramitas have to be fulfilled to become Sotapanna. What he has preached is that if by associating with worthy people one gets to hear the Four Noble Truths and if he conducts himself according to the Dhamma consciously, he can attain the state of Sotapanna and the other higher states. Therefore, what is worthy is not the empty words of vain people but the Dhamma preached by the Lord Buddha.